Mark Hamill has confirmed he will not be at Celebration. EA has announced Star Wars Pinball for the Nintendo Switch. TCW Seasons 1-6, Rebels, the first six films, TFA and Rogue One will be available at launch. TLJ, IX and Solo will come later during the year. TCW S7 will also come at a later date. Cassian will also have eight episodes initially. Surprise host is Stephen Colbert! Teams back together an goes on an adventure at the start of the film! Anthony Daniels is releasing his memoir. The whole ST cast (except Adam)! Bob Iger confirms a film hiatus for the films after Episode IX. Kathleen Kennedy on TRoS and the next ten years. Cola Cola products are canon now? Setting explores post-RotJ, and fall of the Empire. What types of characters would survive, flourish in the chaos before the New Republic is established? Scum and Villainy, inspired by the original Cantina scene and its characters, smugglers, scoundrels, playing up this underworld of SW. Imagery that inspired George, westerns, samuri’s. This transition of when the “Age of the Warrior” was starting to die out and move into a more modern conflict. Sounds like a lot of inspiration and perhaps even porting over some of EU/Legends material into the Mandalorian. Gina Carano – plays a character names, Kara Dune (sp? ); MMA background “I guess I’m an actress now” Dune is an ex-shock trooper. Performed many of her own stunts – Favreau recalls a specific instance of her falling off a high ledge, also tells about a scene where she picks up and carrying a wounded soldier off of the battle field etc. Gina jokes that they had to do that cut so many times, and she was glad that she’d been doing her squats, ha! Carl Weathers – plays the head of a bounty hunter guild, mentions that there are nefarious sides to everyone. He has a job, and is looking for someone to go after a specific product that he needs to deliver to a high-profile client – enter the Mandalorian. Fav- first time filming SW in LA and US, using game engine tech, but blending with the feel of hand made, practical effects, so lots of animatronics and puppetry. Razor Crest (sp?) is the Mandalorian’s new ship! 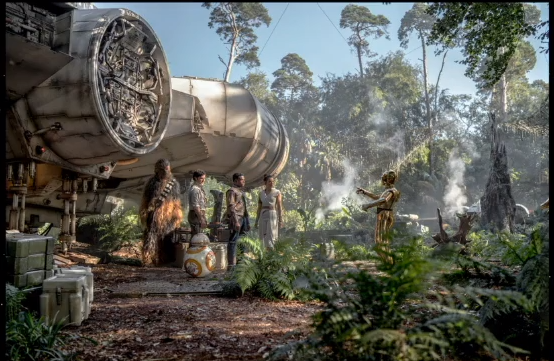 Fav- let’s do a shot with a miniature, ILM senior staff got super excited, huge star wars fans. Favreau hand-built, in his personal garage, motion-control components to shoot ILM ship models just like George and co. did in the OT! The first episode of Season 2 was shown at the panel, but not streamed. A second Tales from Vader’s Castle miniseries is coming in October. Previous Previous post: Episode IX Teaser Predictions!